If you’ve ever been the victim of online abuse – also known as cyberbullying – you’re well aware of the embarrassment and psychological stress it can cause. Cyberbullying is one of the most prevalent cybercrimes in the world today, but few people are conscious of how widespread it actually is. How Bad is the Cyberbullying Problem? One of the reasons cyberbullies have gotten away with it for such a long time is that their ways are often subtle and there is an element of physical and sometimes even digital anonymity that emboldens cyberbullies. Most cyberbullies don’t have the courage to face you in person, so they get online and try to “get” you that way. A random post here, an innocent-looking message there, perhaps even an “accidental” leakage of your personal information. Most people are unaware that they are being bullied and that they can actually do something about it. The truth is, teens are not the only ones subject to cyberbullying. According to a study by the Pew Research Center in 2014, 75% of adults in the United States have witnessed cyberbullying in one form or other. But the truly shocking revelation from that study is that a full 40% of Americans have been the direct targets of cyberbullying. I’ll say that again. 2 out of every 5 people in America are or have been victims of cyberbullying in the past. Flaming: Online fights usually through emails, instant messaging or chat rooms where angry and rude comments are exchanged. Denigration: Putting mean online messages through email, instant messaging, chat rooms, or websites set up to make fun of someone. Exclusion: Intentionally leaving someone out of a group such as instant messaging, friend sites, or other online group activities. Outing: Sharing secrets about someone online including private information, pictures, and videos. Trickery: Tricking someone into revealing personal information then sharing it with others. Impersonation: Pretending to be someone else when sending or posting mean or false messages online. Harassment: Repeatedly sending malicious messages to someone online. 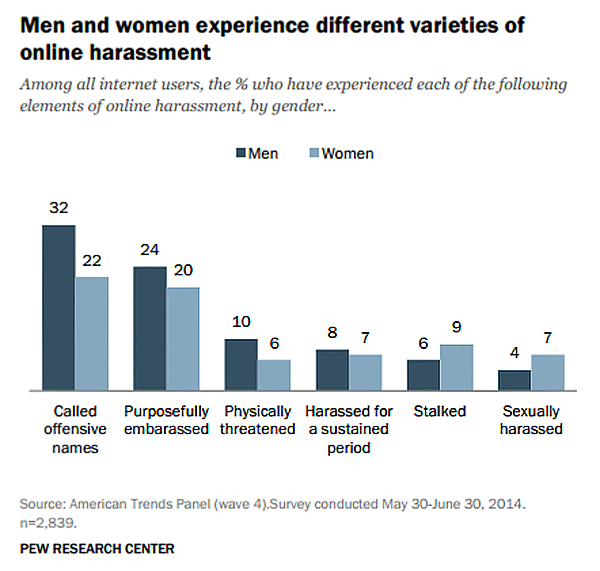 Cyberstalking: Continuously harassing and denigration including threats of physical harm. All of them are dangerous because they can be precursors to actual crimes committed. Often, they cause so much embarrassment that a person might even stop going online or visiting certain communities where they face these situations, but in the extreme it has led to cases of suicide. Therefore, regardless of whether a cyberbully is physically threatening you or merely trying to “diss” you in front of your friends, DO NOT TAKE CYBERBULLYING LIGHTLY. This is such an important concept in the fight against cyberbullying, but few people take it seriously. Bullies are not new to society, but not everyone has the courage to stand up to them, which is why they get away with so much. Being a silent victim of cyberbullying is as good as encouraging it. I know that sounds harsh, but I’ve been a victim of cyberbullying myself in the past so I know this to be true. So How Do You Stand Up To Cyberbullying? Take note of these methods because even one of them can save you weeks, months or even years of mental agony. Cyberbullies – just like normal bullies at school or even at your office, for that matter – are typically cowards with low self-esteem and a lot of pent-up fear and frustration. One of the most effective ways of dealing with a cyberbully is to expose them to the authorities. At times, even the threat of exposure can make them back off. But what if they’re using an anonymous name and you don’t even know who it is? In such cases, threaten to report them to local law enforcement. 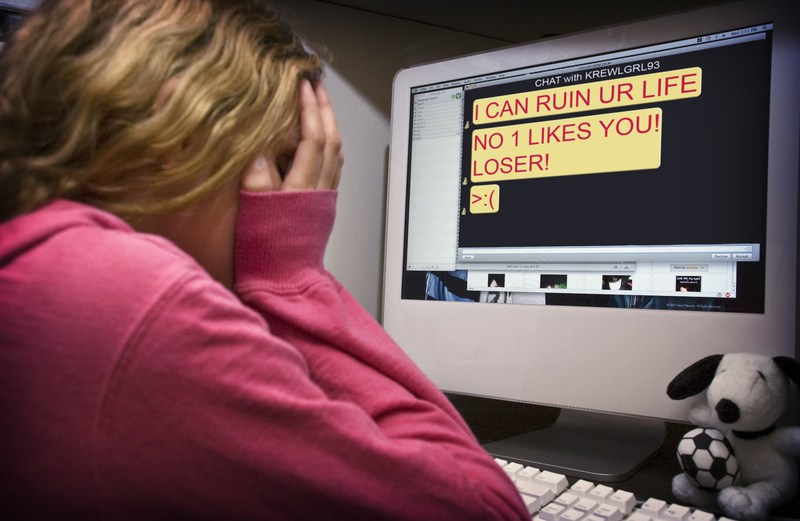 If the cyberbully lives near you, they’ll tend to back off because of punitive consequences. You can also try installing spy-tracking software on you iPhone or Android device, which essentially logs all data. Your local cybercrime unit can then use this information in conjunction with your mobile carrier to track down the culprit. This has so far been the best possibly deterrent against acts of cyberbullying. If you’re bullied by email, report it to your Internet Service Provider. If the matter is serious, such as receiving threats of physical harm, report it to law enforcement officials. In the fight against cyberbullying, screenshots and saved emails are often your best weapon. If you have evidence and the cyberbully is aware that you could take action against them, they’ll more often than not back off and leave you alone. The evidence can also help track the offender if the situation ever gets to a point where you have no choice but to file an official complaint. Cyberbullies are well aware of the negative psychological impact of their actions. In fact, that’s the whole purpose of it. If it helps, trying talking to a close confidante about what’s happening with you online. There’s a good chance they may have an answer to your problem. Even if they don’t, getting it off your chest can be a tremendous relief. It’s not just kids, even adults are often hesitant to talk about their feelings and fears with their closest friends. If that’s the case with you, try to find an anti-cyberbullying forum where you can share tips with other victims so you’ll know you’re not alone in the fight against online bullying. Remember: if you stay silent about the problem, it will continue indefinitely. Don’t take it lying down. Stand up and act against cyberbullying. If you’re reading this on Apple News, please favorite the 1RedDrop channel (next to our logo) to add us to your news feed, or Like our page on Facebook. Please bookmark our site for more insightful articles on current and future technologies that are changing our lives. Are Spy Apps for iPhone Enough to Keep Your Child Safe Online?